Cronon's assessment of what the actual landscape was like during this period of transition is fascinating, detaling the change in how the land was used and what the implications were for both the land and the growing colonial economy. Cusack, Bridget, Ed.. Everyday English 1500-1700: A Reader. Edinburgh University Press: Edinburgh. 1998. Linguistic transcriptions of 64 manuscripts in 8 genres in early modern English. Daly, Donald R. . The Tryal of Bridget Bishop: A transcript of the Salem Witchcraft Trials. New England & Virginia: Salem, MA. 1993. This is just a little pamphlet with transcripts from the proceedings, specifically about Bridget Bishop. 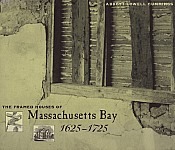 Despite the title, the span of time covers 17th to 19th centuries. A new, revised edition of this book became available in 1996. Debunking the myths we have of our Pilgrim forefathers and -mothers, based on primary sources and first-hand accounts.